Lt. Jessica Shafer, commander of Coast Guard Station Cape Disappointment, and Lt. Cmdr. 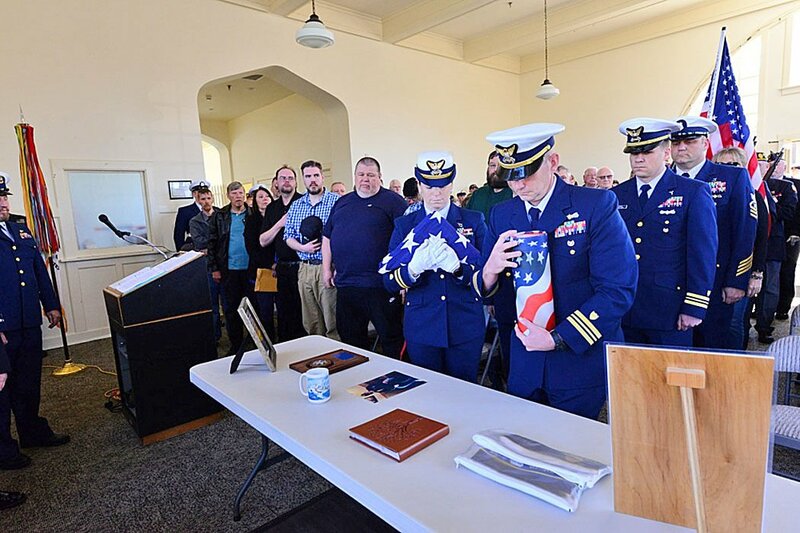 Thomas Condit, branch chief of Mobile Training Unit at Training Center Cape May, N.J., cradled the American flag and Gordon Huggins’ remains during a memorial service at Barbey Maritime Center in Astoria on March 30. Gordon Huggins, left, was the lone survivor from the 52-foot motor lifeboat Triumph, which was lost 56 years ago, along with five of his fellow crewman. Holding Huggins’ hand at a 2017 commemoration was Jeff Rusiecki, a retired Coast Guardsman who with Huggins began a memorial to those guardians who have died in the Pacific Northwest. Crew members from the U.S. Coast Guard Station Cape Disappointment manned the rails during Jan. 14, 2017 wreath-laying ceremony and flyover below the Lewis and Clark Interpretive Center at Cape Disappointment State Park in honor of the Triumph. ASTORIA — Gordon Huggins, lone survivor of a tragedy that has haunted the Coast Guard for nearly 60 years, died March 22 and was honored with a memorial service held at the Barbey Maritime Center in Astoria on March 30. The service was led by members from various veterans organizations that Huggins was a member. An honor guard from Coast Guard Station Cape Disappointment performed traditional ceremonial honors such as folding the American flag, had a bugler played taps and a 3-round volley was fired. Coast Guard members from other local units came to the service to pay respect as well. Huggins served in the Coast Guard for nearly 10 years and left as a petty officer 1st class engineman. He served overseas with Flotilla 1 on an 82-foot patrol boat during the Vietnam War and was awarded the Silver Lifesaving Medal as the sole survivor of the ill-fated Coast Guard vessel Triumph, a wooden 52-foot Motor Lifeboat. On Jan. 12, 1961, while stationed at Point Adams Life Boat Station in Hammond, Huggins was a part of the Triumph boat crew that got underway for the difficult multi-Coast Guard-vessel rescue effort for the crew of the crab boat Mermaid that was in distress on the Columbia River near Peacock Spit. The Mermaid put out to sea over a “rough, but passable” Columbia River bar the afternoon of disaster. A little after 4 p.m., Bert and Stanley Bergman of the Mermaid put out a call that the boat’s rudder had broken and they were near the bar. Long Beach crabber Roy Gunnari, who was following in his boat Jana Jo, relayed the call to Cape Disappointment. The seas were high and the Coast Guard rescue vessels had difficulty securing the Mermaid as the heavy breakers snapped the tow lines multiple times. The rough conditions ultimately caused the Mermaid to sink, which capsized the Triumph. Additional Coast Guard vessels and aircraft were deployed to the scene to search for survivors, as well as foot patrols along the beach. The other five members of the Triumph boat crew and two fisherman from the Mermaid drowned. Huggins had been below deck when the boat rolled and was able to get out when it righted itself. He tried to start the engine, sheltered himself beside a deck structure, and was eventually washed overboard. “Within moments, after several big waves crashed over him, he felt sand under his feet and moments later beach searchers found him,” according to a contemporary news story.